1. 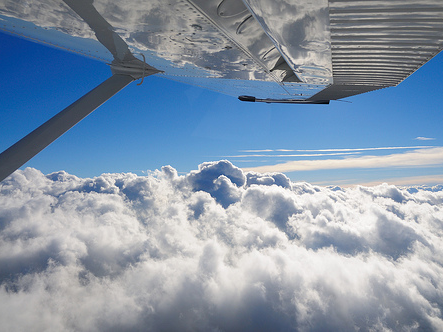 You're a Private Pilot with ASEL ratings. What endorsements do you need in your logbook to fly SCFC's cool Piper Arrow with its great avionics and 200 HP engine? 2. You're a Private Pilot with ASES ratings. What endorsements do you need to fly a Cessna 206 on floats (no retractable gear) with a single 285 HP engine and a constant speed propeller? 3. SCFC's Duchess has retractable gear, variable pitch propellers, and is powered by twin 180 HP engines. In addition to your AMEL ratings, what additional endorsements would be needed? 4. While training with a CFI in a Citabria with a 160 HP engine, would you be able to log PIC time while acting as the sole manipulator of the controls in advanced of receiving your tailwheel endorsement? 4. Yes. Per FAA legal counsel interpretation, the pilot may log PIC time if that pilot is properly rated for the aircraft flown even though the pilot does not have the required endorsements to act as PIC. A Mechanic is Born - Congratulations, Evan! Our club often celebrates the achievements of our member pilots and instructors when they receive endorsements, ratings, and certificates. This month, we congratulate Evan Thibodeau for earning his Mechanic certificate with Airframe and Powerplant (A&P) ratings. In April, Evan passed his practical test at the end of two years of maintenance school, hundreds of hours of logged on-the-job training, and three grueling knowledge tests. 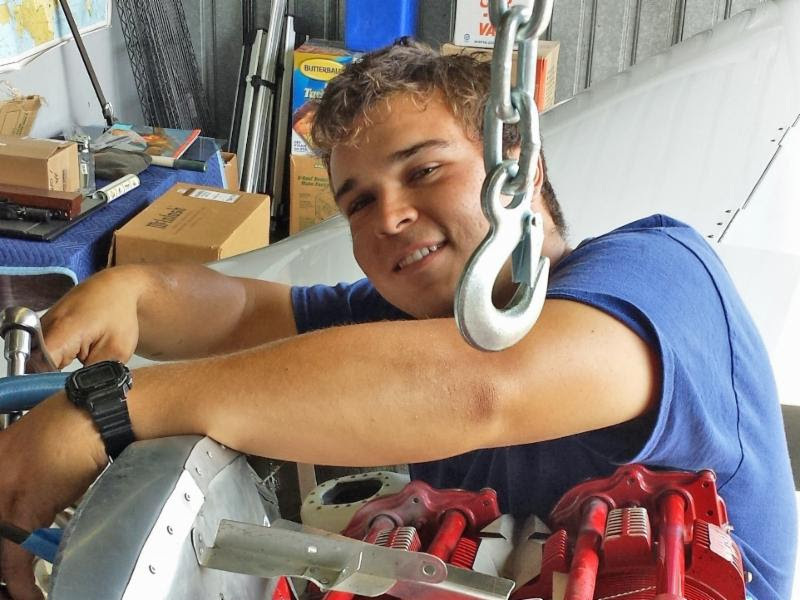 Evan joins as the newest member of the team at San Carlos Flight Center Maintenance. With a staff of six, and four maintenance hangars, SCFC Maintenance is now the largest provider of aircraft maintenance services at San Carlos Airport. Are you ready to start instrument training? Tired of waiting on the ground for a thin overcast layer to clear? 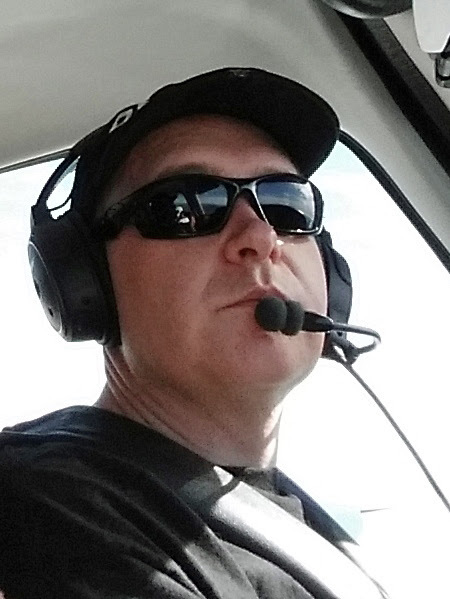 This Thursday, May 7, SCFC begins a new cycle of IFR Ground School taught by CFI Brian Eliot. The class is a great way to begin understanding the intricacies of IFR Procedures and to gain a deeper grasp of the flight and navigation instruments onboard the aircraft. For more information, click here or contact Brian Eliot at brian@sancarlosflight.com. As pilots, it's important to understand the footprint we make on the world. While airports bring much to their local communities in the way of business, entertainment, emergency services, and travel convenience, some people only hear noise. This is especially true of recently arrived residents in housing areas built close to the airport. In partnership with our neighbors, the pilots of San Carlos Airport have made commitments to restrict some flight operations to daytime, avoiding early mornings and late evenings when most people are at home. We've agreed to limit departures to a handful of defined departures to avoid overflying noise-sensitive areas. We did this voluntarily as a way to better coexist with residents of housing areas built too close to the airport. Do your part. 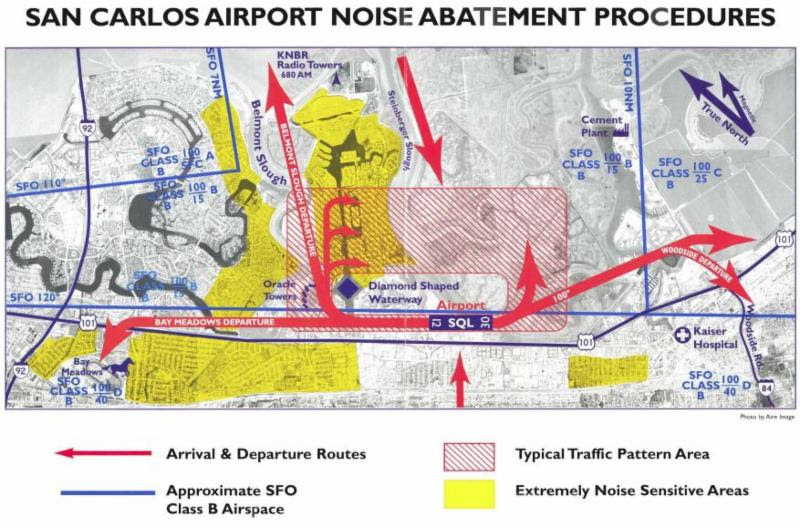 Review the San Carlos Noise Abatement Procedures. Know where not to fly and when not to do pattern work. Safety always comes first, but please make every effort to limit the noise your aircraft generates after reaching a safe altitude. 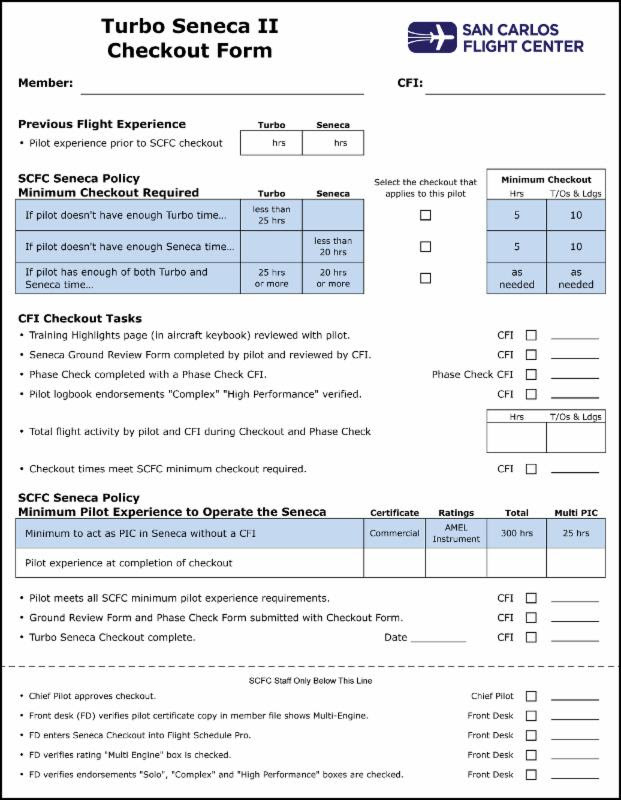 On the day you passed your FAA Practical Test you automatically were checked out in one type of aircraft. You knew that aircraft inside and out and were master of all of its features. Time to bring on the next challenge - your next aircraft checkout. Much transfers easily from one aircraft to the next, but often there are critically new knowledge areas and new pilot skills that must be learned. Factor in the myriad insurance requirements that come in and your next aircraft checkout may seem a complicated challenge. To make the process easier, SCFC recently released new type-specific checkout forms that streamline and simplify the process. These forms are located in the Members Only section of the web site. Summer is a good time to try out a new aircraft, so take a look at the new integrated checkout forms and try out a new pair of wings. SD: Growing up in the UK my parents would take me to the local RAF base for the annual air show, or to the beach to watch the Red Arrows display team. A few years ago I took a demo flight and was hooked immediately. SCFC: What have you accomplished since then? SD: I earned my private in 2012 and instrument rating in 2014. I recently transitioned to a Cirrus, which is an amazing plane. I will be going for more ratings in the future. A 2-week seaplane course in Alaska would be a fun holiday, the scenery up there looks absolutely stunning. SCFC: What kind of flying do you like best? SD: I like taking friends for their first flight in a small plane. They're always amazed by the view, and how much of the local area we can fly over. For solo flights, I like going to places I've never been before, especially if it's a good distance out of the local area. I have some long trips planned for this year, the longest being to Austin for the Formula 1 race. SD: So far my favorite trip was to Las Vegas. I think that's a bucket-list item for a lot of Bay Area pilots, and if you factor in all the lines at a commercial airport, the time to get there is about the same. The view on the way in was great, ATC gave me vectors directly over the top of KLAS, and you could clearly see the entire strip. On the way back the restricted area was cold, so I got a shortcut over the top of Edwards. SD: I'm lucky that playing around with computers was an interest growing up, and now I get paid to do it. I normally work on large enterprise systems, most recently in Linux based storage. Outside of work I like to travel. I'd love to go to every Formula 1 race in a season - the races are all around the world, so going to each one would be around 20 different countries in an 8-9 month period. Being a pilot is an honor and a privilege. But to those who don't yet fly, it is very mysterious and sometimes hard to understand. You can do your part to support general aviation by helping to share your story with people interested in learning more about it. 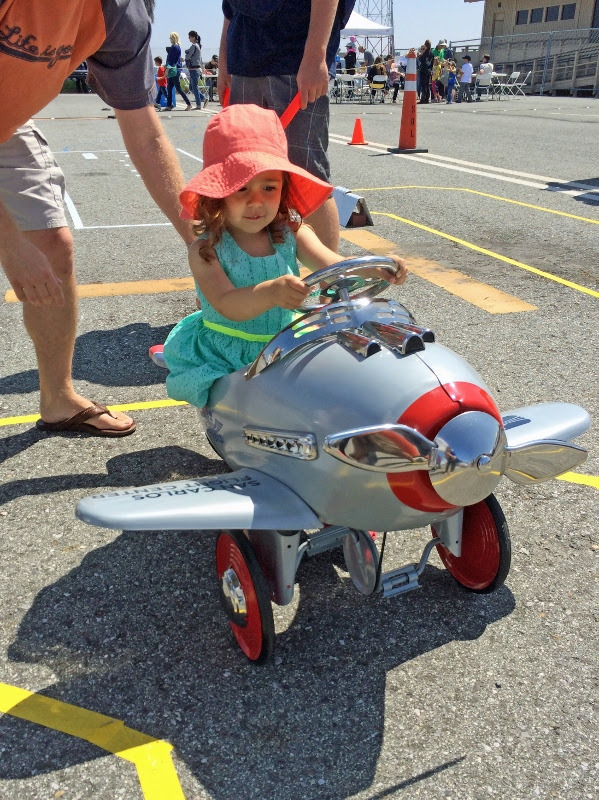 Join us at any of our upcoming Air Shows or Airport Day events. Meet adults with questions about becoming a pilot. Talk with children and encourage them to aim for the skies. It's a great way to give back to the aviation community and realize what a gift it is to be a pilot. If you are interested in helping build GA, contact Terry Fiala at terry@sancarlosflight.com and join the fun. 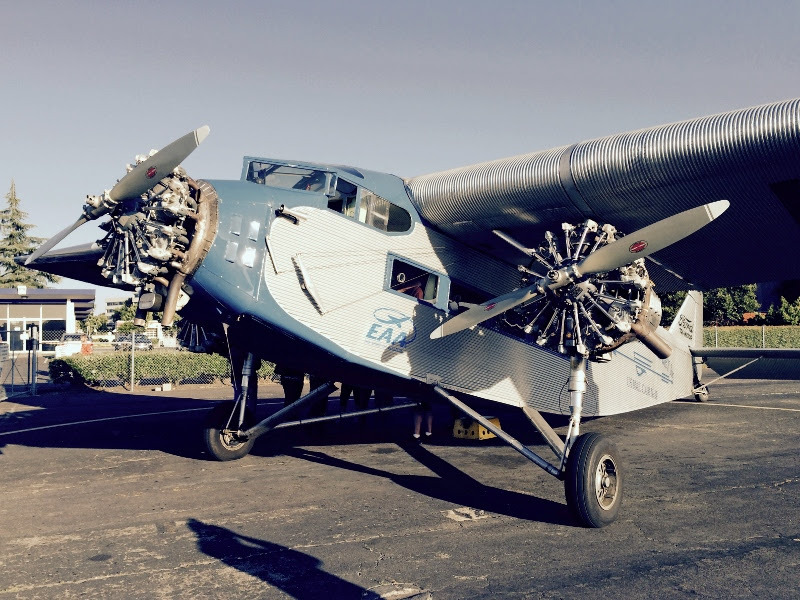 One of the few remaining airworthy Ford Tri-Motors in the world will be stopping by San Carlos Airport, May 7-10. Take a step back in time to the golden age of aviation, when air travel was considered a luxury, with a flight on the "Tin Goose." Click here for more information and to schedule your flight. 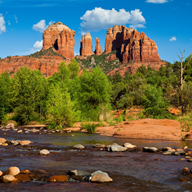 May's FOG destination is beautiful Sedona, Arizona - home of spectacular sandstone rock formations that glow red and orange in the southwest sunlight and the airport atop a mesa overlooking the city.